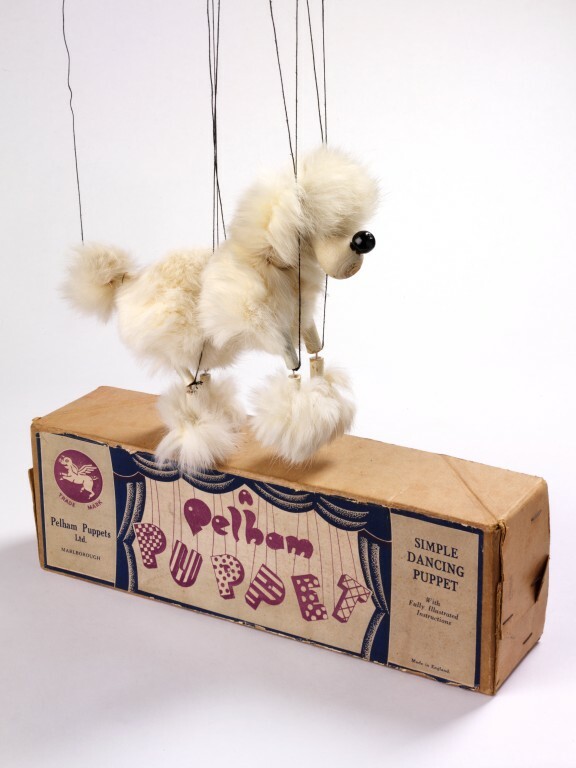 Pelham Puppets Ltd was started by Bob Pelham in 1947 making marionette puppets for children. They were simple wooden marionette puppets painted in bright colours and usually wore brightly coloured felt clothes. Many of the puppets produced by Pelham were characters from well known children's stories like Hansel and Gretel, and Little Red Riding Hood. Bob Pelham had always been interested in the way string toys moved. He had originally started up a company called Wonkey Toys making Wakouwa's. A Wakouwa is a wooden toy, usually in an upright position, held together by string. It stands on a base which when pressed collapses the toy and when released returns the toy to its original position. 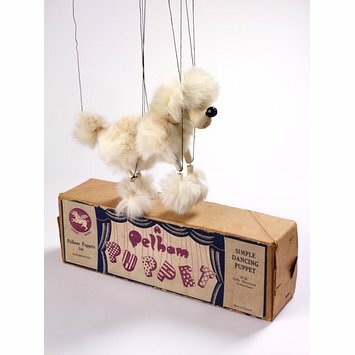 Pelham puppets are still very popular today in a strong collectors' market. A poodle marionette, made of wooden sections loosely held together by string covered in white rabbit fur. The puppet has all its strings that are attached to its wooden control bar. The dog has a large circular black nose the sticks out from under its fur. The box made of plain brown card with a large label covering the top with 'A Pelham Puppet' written on it. Inside the box on loose paper are the instructions and a letter from Pelham puppets for their club. A poodle marionette made of white rabbit fur and wood, with its box and instructions made by Pelham Puppets Ltd in England during the 1950s.